This is one of those occasions when I stood for a while pondering whether to take this photograph and decided it was worth it. I liked the scene but I just wasn’t sure if the tree would come out properly against the……….well let’s face tree lined background. I just wasn’t sure if a tree against a tree background would come out that well. This is one of the very few disadvantages of black and white photography, sometimes you get a scene with varying shades of green but obviously you can’t seen green in black and white. The problem then arises as to whether the entire shot will just blur into one big blob of the same colour. Thankfully the fallen tree in the foreground was almost completely without foliage and it’s almost brown like branches gave me just enough contrast in colour to the rather fluffy evergreens in the background. I am so glad I took the time out to take this photo, I actually only took it two weeks ago but I went back there yesterday to show my three year old son and he was looking at me with a rather quizzical look on his face. Why?, well, it’s gone actually. I have no idea how long it had been there but lo and behold it’s all gone, not even an aul stump remains. The tree was situated just at the back of the cricket pavilion and I have noticed a huge pile of earth and rubble in the car pack at the rear of the pavilion, if you don’t know where that is and you have ever been to the zoo then chances are you have parked there on many an occasion. Sometimes I write or tell people about places in the park that I just assume everybody knows about but alas many of you don’t. If you ever feel the need to explore the cricket pitches [yes there are two] then let me direct you there. When you enter the park through the main gates just keep going straight through the first roundabout. After that you need to look over to your left, don’t try this whilst driving though, you can drive up a little bit and you will see two very small little roads one after the other. Take either of these roads or even park on the main road and walk over. Once you have stopped you really can’t miss the cricket fields. You might also like a little trip into the beautifully secluded pond, for some reason named “The Dog Pond”. This is a great place to just sit for a while and basically think about a huge bunch of nothing. Now, that’s the end of Dave’s mini tour of the cricket pitches and their environs. 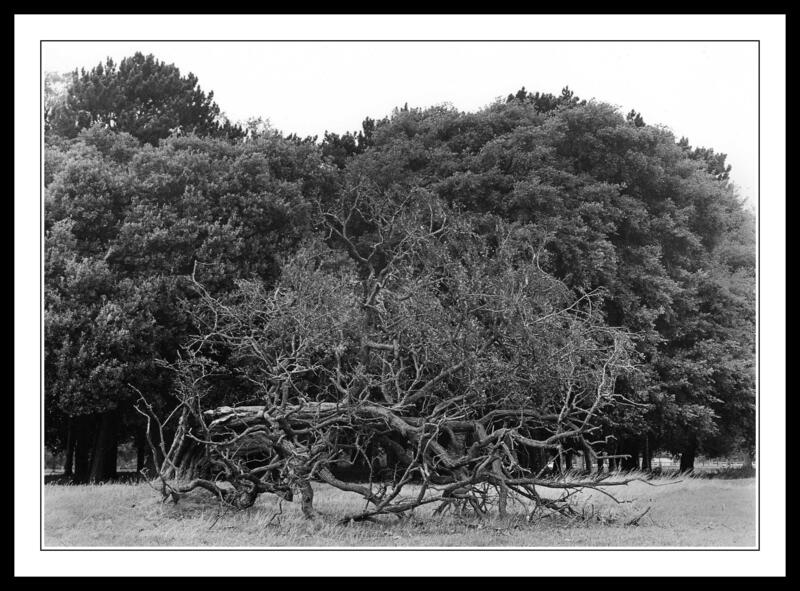 This entry was posted in Black and White Photography, Film Photography, Irish Landscapes, Phoenix Park, Photography and tagged Black and White, Black and White Photography, cricket pavilion, Cricket Pitches, Dog Pond, Film Photography, Medium Format, Phoenix Park, Photo, Photography. Bookmark the permalink. Works for me. I like the horizontal trunk and wiggly branches against the bushiness and stumpy vertical trunks behind. Thanks so much for all your lovely comments on the photos, means a lot to me to hear some feedback from folks. You have been busy I see.